On Monday, a jury awarded $11.3 Million to a man who was shot in the back and rendered a paraplegic by a San Jose police officer. Hung Lam a 38 year old man of Vietnamese decent was holding a knife at the time of the shooting, but was only threatening himself and according to witnesses represented no danger to Officer Dondi West, who shot him on January 3rd 2014. Police had claimed that Lam “advanced toward an officer” and that he was a suspect in a fight with a neighbor. However, that neighbor was one of the witnesses that disputed the contention that Lam was ever a threat to Officer West and also testified that he was not fighting with him, but rather was trying to talk him out of harming himself. Police were called at 3:23 p.m. because Lam had been threatening to hurt himself, holding a knife to his abdomen with one hand and a cellphone in the other. His neighbor was trying to talk him out of hurting himself when police arrived, according to the complaint. 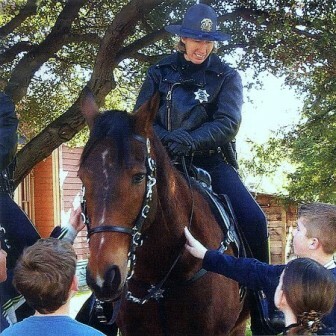 Officer Dondi West (and the horse she rode in on). As soon as West arrived, she started running toward Lam screaming commands like “drop the knife” and “get on the ground” but Lam was still talking to his neighbor and not facing the officer. When she reached within 10-15 feet of Lam, she shot him twice in the back, hitting his aorta, lungs and kidney. He was rushed to a hospital and survived due to surgery but was left with no mobility in his legs. Lam, once a vibrant dancer, was left permanently disabled, according to the complaint. He was initially charged with assault on a police officer but those charges were dismissed by the time the federal lawsuit was filed in February, according to the complaint. “The officer’s outrageous display of excessive force sentenced Hung Lam to a lifetime in a wheelchair, as a paraplegic,” [attorney John] Burris said in a statement Monday. It took the jury three weeks to decide that the taxpayers of San Jose should be forced to compensate Lam for Officer West’s hasty and near murderous actions that day. In case you’ve been living under some sort of rock for your whole life and haven’t realized it yet, this is also yet another reminder not to call the police to “help” people suffering through some sort of mental health issue, unless you’re okay with them being killed or permanently crippled.